New Winter 2018: The Dance! Dance! Dance! Christmas ornament personalized from Russell Rhodes is a must-have for dancers of all ages! Because it is a personalized dance ornament, we’ll add the recipient’s name and year where shown using a stylish font to create a unique gift dancers will be thrilled to have, a cherished keepsake of their dancing years. It is one of many personalized dance ornaments we offer, so you’ll find others for your collection. 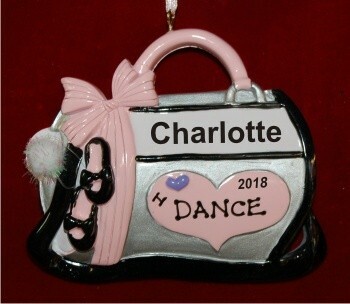 The dance bag personalized Christmas ornament looks 3D, but it has a flat back, perfect for adding your sentiments and words of encouragement. For details, see Back Message under Ornament Options.